So, is Finance Minister Natalie Jaresko waking up to reality? Fulfilling the requirements of the IMF will make the majority of Ukrainians homeless – said the Minister of Finance of Ukraine, according to Ukrainian portal MIGnews. The International Monetary Fund expects the Ukrainian authorities to adopt such laws which will make the majority of the population in the country homeless, said the Finance Minister of American origin Natalie Jaresko. According to her, one of the outstanding issues before the transfer to the Ukrainian authorities of the next IMF loan is the failure of the Verkhovna Rada to pass some bills. In particular, the following: “The bills related to improving the capabilities of “Naftogaz” to collect their receivables. We are talking about the removal of various existing barriers, which currently do not allow this,” – said Jaresko. According to her, there are two such problem bills. “One of these bills, I know, is on the agenda of the Verkhovna Rada on Thursday, and the second one the government will have to submit a second time, since it failed to pass”, — said the Minister of Finance. Currently in Ukraine there is a moratorium on forced evictions of debtors. This is justified under conditions of a severe economic crisis in Ukraine, frozen wages and social benefits. The consequence of the crisis was the rise in unemployment and a sharp fall in real incomes. People are objectively unable to pay the utility bills, which the government of Arseniy Yatsenyuk raised several times. The second bill will make the rates profitable for the utility companies. Currently the utility companies are mostly municipal and are subsidized from the budget, operating without profit or at low profit. The adoption of the law, rejected by Parliament, will allow to raise utility prices several more times — now by decisions of the enterprises themselves, which will be granted such a right. The adoption of this law will make Ukrainian housing and utility services attractive for foreign companies, emphasized earlier Prime Minister of Ukraine Yatsenyuk. In case of adoption of these IMF bills the utility rates will increase several more times, the housing sector will pass to foreign companies, which will begin evicting Ukrainians from their homes for non-payment. Ukraine in the framework of the joint program with the International Monetary Fund expects to receive a second tranche of approximately $1.7 billion. Is George Soros paying the salaries of Ukraine’s three new ministers? In November, George Soros wanted the EU and the IMF to pump $20 billion to defend Ukraine. In January, he said he wanted $50 billion. He’s invested in Ukraine. He wants his work to succeed. Here’s an example. Sorostan. Is the Soros backed Renaissance Foundation paying the salaries of Ukraine’s three new government ministers? 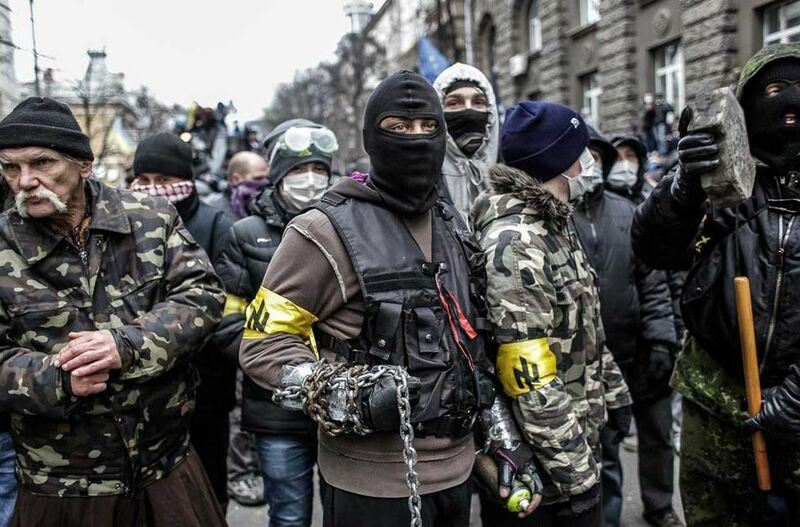 George Soros has firmly sunk his hooks, or claws, into the rump roast that is becoming Ukraine. His Renaissance Foundation is responsible for head hunting, hiring, and apparently paying the salaries of the three new non-Ukrainian government ministers. Sorostan is born. Possibly the world’s most evil man now has three employees nicely positioned in Ukraine’s government. And Ukrainian citizens thought their Oligarchs were crooks…they ain’t seen nothing yet. It was founded in April 1990. IRF is an integral part of the Open Society Foundations which incorporates national and regional foundations in more than thirty countries around the world, primarily in Central and Eastern Europe, as well as the former Soviet Union. These foundations share a common goal of supporting educational, social and legal initiatives that promote the development and establishment of an open society. IRF is the Ukraine’s one of the largest charity organization. Its main objective is to provide financial and operational assistance to the development of an open and democratic society in Ukraine by supporting key civic initiatives in this area. Over the period from 1990 to 2010 the International Renaissance Foundation supported numerous Ukrainian non-governmental organizations, community groups, academic and cultural institutions, publishing houses etc. in the amount of over $100 million. The International Renaissance Foundation’s mission is to foster an open, participatory, pluralist society based on democratic values in Ukraine. Our projects and grantmaking are guided by the principle that real change can only come if people’s rights and dignity are secured. This belief informs our pursuit of two interlinked goals: ensuring access to justice for all and empowering civil society to be a primary source of positive change in Ukraine. The foundation works with leading Ukrainian nongovernmental groups to engage them in developing a shared public policy agenda for the country, catalyze initiatives that address corruption, and prevent backsliding from democratic reforms. Our efforts to reduce corruption in higher education have resulted in the institutionalization of anticorruption mechanisms in university admissions testing. We also support projects and groups that advance the rights of vulnerable populations, improve public health, and confront discrimination. Read between the lines and you will understand the the Renaissance Foundation is all about regime change, in order to help make Mr. Soros and his banker clan even more rich and powerful. The Renaissance Foundation was conveniently commissioned by President Poroshenko to head hunt for “qualified” persons willing t0 take part in Ukraine’s new government. Lack of public service professionals on the Ukraine labor market has pushed the government to look abroad for qualified applicants who can take positions. Prague-based Pedersen & Partners and Korn Ferry, global head hunting firms, have found 185 potential employees, many of whom are members of Ukrainian community in Canada, the U.S. and the U.K. The Renaissance Foundation, a global network of policy consulting centers launched by American billionaire George Soros, has sponsored the headhunting process. It paid as much as $82,200 to two companies involved in finding the capable employees for the government agencies. As of now, Ukrainian legislation doesn’t allow the foreigners to hold any public offices, which is why those who’ll accept the government’s job offers will have to take Ukraine’s citizenship. Meanwhile, dual citizenship is not allowed. President Petro Poroshenko during his Nov. 27 speech in parliament offered to allow the foreigners be officially employed in the country’s government. Moreover, he asked the lawmakers to provide him with legal tools to grant Ukrainian citizenship through special decrees. Meanwhile, Natalie Jaresko, U.S. citizen of Ukrainian descent and chief executive officer of Horizon Capital, a private equity fund with $650 million in assets, is considered to be a candidate for the position of finance minister, according to the Kyiv Post research. In December, a multi-billion-dollar loan [variously stated as $3-$3.5 billion] to Ukraine comes due, which Ukraine had received from Russia. The IMF has provided a new debt plan, however, dictating that existing loans to Ukraine that have an expiration-date are to be subjected to a haircut. Thus, the resource gap of the country totaling $40 billion is to be reduced. Since the crisis, Ukraine has received several loans from the IMF and the EU [and the U.S.]. These loans must be repaid in a few years from now. However, the financial situation of the country remains vulnerable. Over the next four years overdue loans totaling $15 billion need to be paid [they’re mostly loans from Russia]. Only three billion of them are an old loan Russia that has to be paid in December of this year. The IMF might prevent it [from being repaid in full, even though it has seniority over the new loans that are coming from the West]. The IMF has developed a program for Ukraine, under which the current financial hole is to be filled in the amount $40 billion. The due debts [the senior debt] are part of the plan, and will be restructured, according to the IMF. Exactly how it is to happen, the IMF does not explain. Experts say that the IMF believes that Russia should participate in a haircut. The Financial Times reports [“Bailout projections indicate Ukraine will not repay Russia debt” 5:21 PM, 22 March 2015] that the IMF requires that Russia’s $3.5 billion bond issue be included in the restructuring. Charles Blitzer, a former IMF employee, has informed the FT of this. However, Blitzer is uncertain how large the haircut will be. ”It is up to the Ukrainian authorities to determine the extent and nature of the debt restructuring,” he said. [In other words: the IMF will grant Ukraine the right to determine how much of that $3-3.5B will be repaid to Russia. The Kyiv Post puts it this way: “Kyiv does not intend to fully repay a $3 billion bond owed to Russia this year according to official projections underpinning Ukraine’s new international bailout, say credit experts.”] Government sources close to the matter estimate that there will be a planned debt reduction of 50 percent. ”But creditors would rather try to agree on a term extension,” said Blitzer. Whether all international creditors will accept a haircut, and if so, to what extent, is not yet clear. Last week, Russian Finance Minister Anton Siluanow said that Russia still expects that the $3.5B debt will be repaid this December in full. And Franklin Templeton [Funds], the largest bondholder of Ukraine, has brought in Blackstone legal help for debt negotiations. Ukraine’s new Finance Minister Natalie Jaresko, who has become the face of reform for the U.S.-backed regime in Kiev and will be a key figure handling billions of dollars in Western financial aid, was at the center of insider deals and other questionable activities when she ran a $150 million U.S.-taxpayer-financed investment fund. Prior to taking Ukrainian citizenship and becoming Finance Minister last December, Jaresko was a former U.S. diplomat who served as chief executive officer of the Western NIS Enterprise Fund (WNISEF), which was created by Congress in the 1990s and overseen by the U.S. Agency for International Development (U.S. AID) to help jumpstart an investment economy in Ukraine. But Jaresko, who was limited to making $150,000 a year at WNISEF under the U.S. AID grant agreement, managed to earn more than that amount, reporting in 2004 that she was paid $383,259 along with $67,415 in expenses, according to WNISEF’s public filing with the Internal Revenue Service. Later, Jaresko’s compensation was removed from public disclosure altogether after she co-founded two entities in 2006: Horizon Capital Associates (HCA) to manage WNISEF’s investments (and collect around $1 million a year in fees) and Emerging Europe Growth Fund (EEGF) to collaborate with WNISEF on investment deals. U.S. AID apparently found nothing suspicious about these tangled business relationships – and even allowed WNISEF to spend millions of dollars helping EEGF become a follow-on private investment firm – despite the potential conflicts of interest involving Jaresko, the other WNISEF officers and their affiliated companies. From 2007 to 2011, WNISEF co-invested $4.25 million with EEGF in Kerameya LLC, a Ukrainian brick manufacturer, and WNISEF sold EEGF 15.63 percent of Moldova’s Fincombank for $5 million, the report said. It also listed extensive exchanges of personnel and equipment between WNISEF and Horizon Capital. But it’s difficult for an outsider to ascertain the relative merits of these insider deals and the transactions apparently raised no red flags for U.S. AID officials. Regarding compensation, WNISEF’s 2013 filing with the IRS noted that the fund’s officers collected millions of dollars in bonuses for closing out some investments at a profit even as the overall fund was losing money. According to the filing, WNISEF’s $150 million nest egg had shrunk by more than one-third to $94.5 million and likely has declined much more during the economic chaos that followed the U.S.-back coup in February 2014.